I love supernatural horror! Insidious Chapter 2 was amazing. It was just as good as the first one. I'm a bit weary of saying it was better. But, it didn't fall prey to the curse of the sequel. If you liked Insidious, you'll like Chapter 2. Like the first one, Insidious Chapter 2 had an open ending. I'm so hoping there's gonna be a third movie. I've been trying to determine whether it was scary. I mean, I'm a terrible judge of what is or isn't scary. 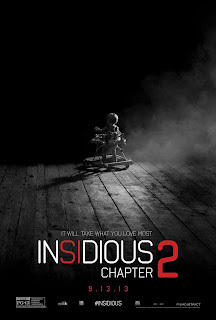 Insidious, the first movie, was amazing, but I didn't find it scary. I'll say Chapter 2 was chilling. It had some good "make you jump" moments. It was amazing at building suspense. 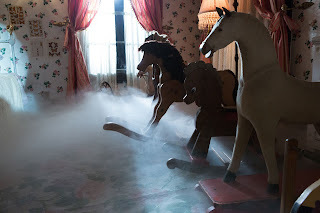 Unlike most supernatural horror stories, the haunts were non-stop. It didn't have a period where nothing happened. I was nervous about the unveiling of the "monster." In the first movie, you had this build-up of the black figure with the red face haunting the little boy. When you actually saw it, the thing was comical. It almost ruined the movie for me. I mean it was so bad. I was afraid they'd do that again. They didn't. The ghosts in Chapter 2 were creepy not comical. That room full of bodies was intense. I liked it. It didn't look exactly like this in the movie, but it's close enough. The atmosphere was darker. More importantly, Chapter 2 had no gore. 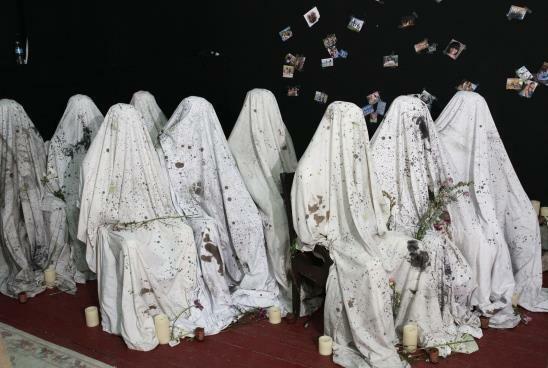 Despite the fact that people had walked into a hidden room, full of decaying bodies, we didn't see the actual bodies. Rows of sitting dead people covered in white sheets have far more impact than uncovered decaying bodies. Even better, the plot was interesting. I liked how it revisited the first movie. We spent more time in The Further. Still don't like the name. The Further, really? So anticlimactic. It has got to be the most uncreative name in history. For such a haunting place, it has such a dull name. Chapter 2 added a time travel element to The Further. The movie never explained how this was possible, but they were consistent with it so, they didn't need to. Insidious Chapter 2 had a few funny moments. I was surprised, but it didn't take away from the creepiness. The problem I had with it wasn't the actual movie, but with the audience. With a PG-13 rating, you're gonna get children talking through the movie or screaming dramatically. It was so annoying. I love this genre, but how many ways can a ghost or demon torment a family? We have electronic toys going off on their own, a piano playing themselves, a ghost slapping people unconscious, phantom knocking, a ghost appearing only on camera. It creepy, but it's not original. I'll admit, though, a "ghost" slapping the mess out of two people was pretty epic. It gotten be tough to release a movie like this and try to not make it look like all the other supernatural horror movies. Even worse, this one had to follow The Conjuring, which pretty much has the same premise. 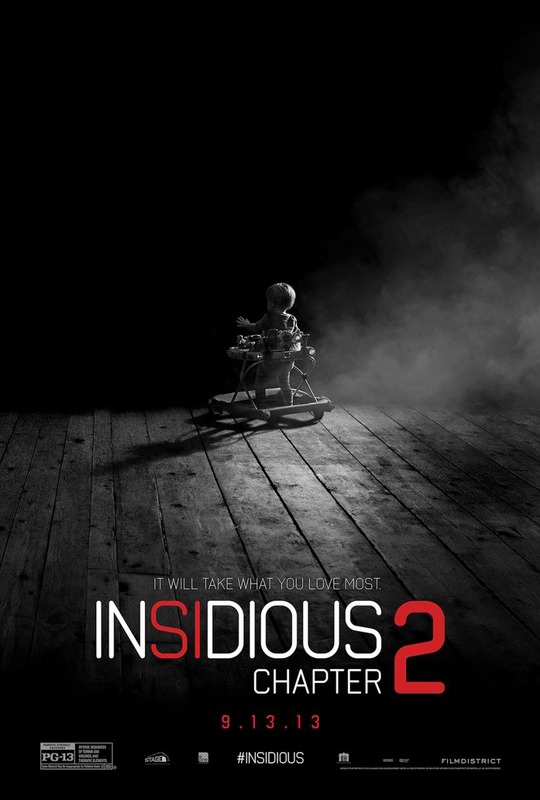 Though Insidious Chapter 2 was good, it didn't add anything to the genre. It was a fun watch. I'd see it again, once it's available on Amazon, and I don't re-watch movies often. Good review Auden. Wasn't scary, but I guess you can enjoy yourself if you go in expecting a bunch of unintentional laughs. It's not the genre I'd tend to go for... and somehow a movie having the word Chapter in its title seems, well... off putting. I haven't seen the first one yet. I'm so behind on my movies. I need to get caught up. Great review!